No, I don't ski. And no, I don't like the cold. I don't even celebrate Christmas (Well, not technically. Though the tree in my living room would beg to differ.) Typical joys of the season aside, I am personally excited by December because it means that roasting season is in full swing! Now, many of you omnivores may be asking, well, what on earth can a silly vegetarian possibly be roasting... vegetables? You bet! But not just any stand alone boring veggies - for the sake of bored tastebuds everywhere, I like to be creative. (A) I have a massive bunch of leftover dill in the fridge. (B) I've been on a Greek yogourt kick obsession lately. (C) Two weeks ago, I purchased ten pound bag of beets. My father claimed I'd never eat them all. Though the photo above has an eerie resemblance to raw meat in a dish, no animals were harmed in the making of these delectable roasted beets with yogourt and dill sauce. Simple. Pretty. Filling. Perfect dish to pair with whatever else your little roasting heart desires, or enjoy them all on their own. Nutrition Facts: If you've never eaten beets before, don't fret! This is your chance to try them in all their glory. 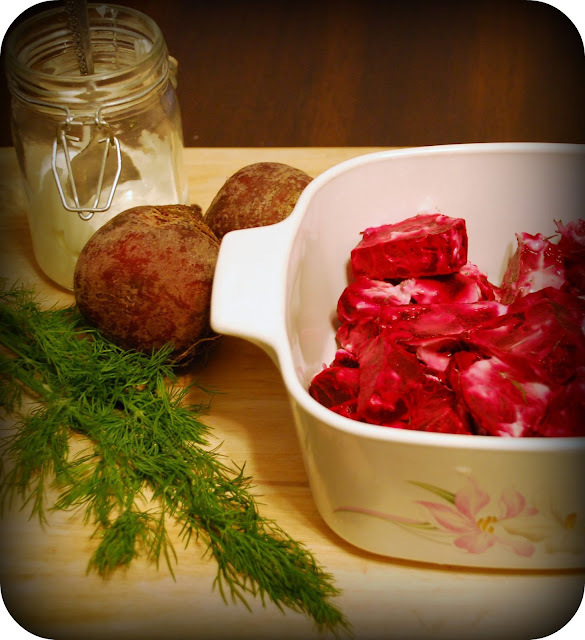 Much healthier than the sodium-laden pickled variety, roasted beets scream healthfood! Not only are beets fibre rich, they are nutrient dense as well! The pigments that give beets their rich color are called betalains and are a unique phytonutrient. * They are known to provide antioxidant, anti-inflammatory, and detoxification support. The consumption of beets is also known to be beneficial to the bloodstream due to their high iron content. What's more, this dish has an unexpected nutritional benefit: loads of protein from the greek yogourt - a whopping 10g per serving! Well, what are you waiting for? Beet it! Heat oven to 425F. Wrap each beet in foil. Place on middle oven rack. Roast for 60 minutes. Remove from oven with protective glove - open up foil enough to let beets cool. Meanwhile, in a small bowl, combine yogourt, dill and mustard. Cover and refridgerate until ready to use. Once beets are cool enough to handle (about 30 minutes), remove from foil and slice into wedges. Toss with yogourt mixture and salt. Can be served warm or chilled. i love them but somehow for color reasons i've been eating the golden ones... haha!! !